Hear why audiences rave about Jan Arnold! Simply click on a picture or highlighted text to select an audio file to play. Please note that these files require the RealPlayer plug-in or other players of your choice. If your internet web browser is of a version 4.0 or higher (less than 2 years old), this plug-in should already be present on your system. If you're not sure if the RealPlayer plug-in is installed, just try clicking on one of the pictures. If the RealPlayer interface does not appear after the file has downloaded, then you can acquire it for FREE by clicking on the RealPlayer logo below. Click to download the FREE RealPlayer plug-in. These audio clips are brief excerpts from live performances in Tennessee, Colorado and Michigan - just a small sampling of Jan's incredible repertoire! 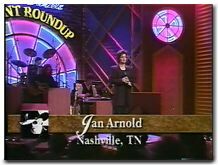 Charlie Daniels Roundup--TNN Jan's performance on the Charlie Daniels Show. Click here to view a lower quality, but faster loading version of this clip. Tennessee Hayride Jamboree, a show broadcast in Nashville, TN. Jan is the special guest of the week. Jan performs at the Historic Calumet Theatre in Calumet, MI..
A production directed, sponsored, promoted and produced by Miss Jan Arnold. Jan performs this bluesy song from the heart. Jan is invited to be a guest on this Vail, CO Morning TV Show. Jan and Band on ABC 5, WBKP's Midday Show, promoting her up and coming show at the Calumet Theatre. Another song from her Midday television performance.